There is a funny article (to anyone actually in the children's book industry) on how to win the Caldecott in 3 easy steps posted on eHow. It made me laugh at the apparent simplicity of it. If it were actually that simple, it wouldn't be a great award, and everyone would have one. Read it here. I think eHow wanted to boost their readership by posting about a topic everyone wants the secret to, and there's nothing wrong with that. It made me chuckle. Then an illustrator acquaintance of mine, Fred Koehler, wrote this blog post on "How to Get Published" in three simple steps kind of as a spoof. See it here. 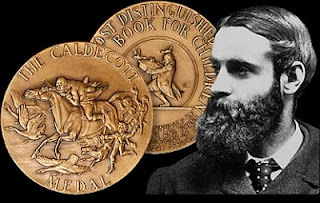 There are actually bits of real truth in it as there are in the Caldecott post. But his post also made me smile. Some people think creating a book is so simple. The principles actually may be simple....but the execution is not. Creativity seldom is so simple as following a set of steps. But truth be told, it's a great place to start. 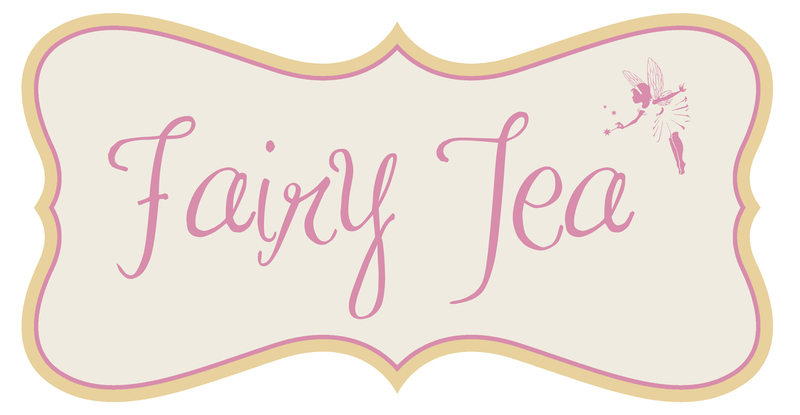 By way of announcement, this Friday, March 2nd, and Saturday March 3rd, I will be signing "Dear Cinderella" at the Provo City Library's Annual Fairy Tea Party. 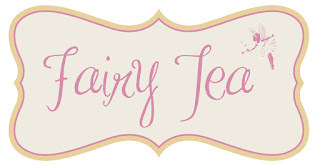 I will be signing for a half hour before and after each tea party. However, if you were not able to obtain tickets to the party (they are sold out), the fairy store and my signing table will be just outside the event, so all are welcome to come by and get a book. 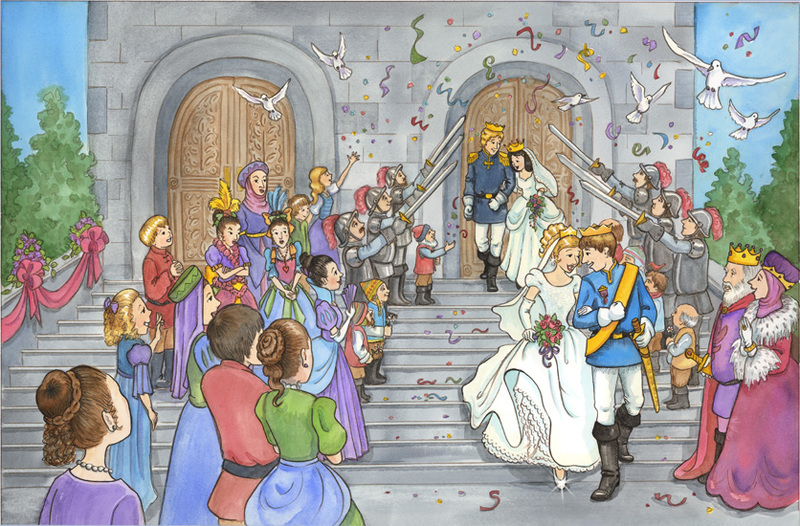 Don't miss your chance to see ME dressed up as a princess, get a signed book for your princess, and to peruse the fairy, princess trinkets in the shop. 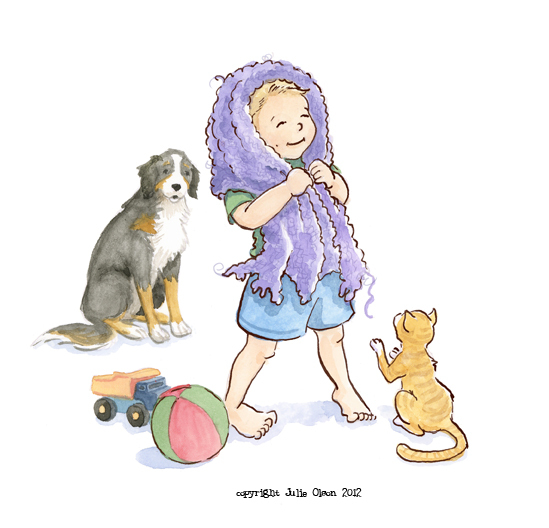 Well, I'm closing in on finishing a picture book I've been working on since September. 1 more illustration to go. The author is Kirt Hickman and the book is titled, "Purple." It's a sweet story about a little boy and his blankie, written in the same spirit as "The Giving Tree." Although, in this book, if I had personified the blankie like the tree in that book, it'd be a little monster blob and kind of freaky. Here's a sneak peak at an illustration. I've been thinking about LINE recently. I've been thinking about how much I love LINE, how much Line expresses, and how much BETTER I need to get with my own LINE in my drawings/illustrations. I started to sift back through some notes and posts and sketches. I came across one of my idols especially in regard to expressive LINE. I've had the opportunity to be his (and his wife's) host at a conference for a few days and gained great inspiration from our discussions. The bits of his life story he shared gave me glimpses into from where his artistic expression emanates. And the fullness that his added to his life and art can be better understood only by seeing him and his sweetheart, Sarah Small, together. His art is amazingly expressive with a few simple lines. And then he adds tone and value and it's even more alive. 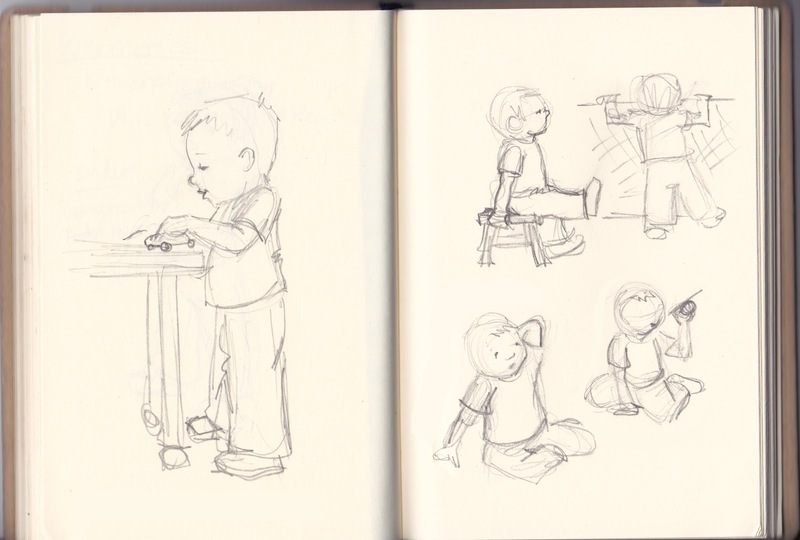 Here are some notes I took a few years back in my sketchbook. Click to see larger and read. David's graphic memoir, "Stitches," gives everyone a glimpse into his life growing up. Not a book for young children, but for teens and adults, the art in "Stitches" is a prime example of his mastery of expression. Thanks for the inspiration. What do you sketch in when you are "on-the-go?" I have a few kids (4 to be exact) so I seem to be GOING a lot...especially in the hours between school and bedtime. So whether I'm sitting at the orthodontist, in the school car-pool lane, or at a lesson of one sort or another, I try to remember this little guy...my mini sketchbook. He fits in my pocket, in my stuffed diaper bag, in my bottomless purse, almost anywhere (along with gum, diapers, toys, books, band-aids and binkies). Do you have a little friend you bring along? To prove I am actually practicing what I preach (tips for better illustrating), I just thought I'd share one spread out of my mini sketchbook I doodled while hanging with my 18 month old yesterday. I'm stepping away from the desk. Finishing up the last few paintings of a book is always hard for me. By the time I get to that point, my mind is often on to the next idea and I've lost some of the creative steam I had as I began painting. It kind of happens in every stage actually. Today I'm there...at the point where I kind of want to be done. Is that a bad thing to admit? I thought about this and I decided that actually forging ahead, finding that creative spark again and finishing a project is what sets the professionals apart from the wanna-be's. If you're still in that stage where you can't seem to finish a project, don't despair. You can do it. Here are some tips of what I do to FINISH and work as a professional. 1. Take a Break. Sometimes you need to step back and away from the work. You need to do something crazy, fun or simply relax. Sometimes that takes a day, a week or a month. Now as a professional, you often don't have an entire month to set aside a project, so you just have to learn what brings you the most satisfaction and relaxation in the shortest amount of time. Personally, I read a book, go on a date with my husband, or simply shut the door to my studio for a bit so I don't have to look at what's waiting. 2. Put on your favorite music or movie. Play it in the background as you work. You know it well, so it won't distract you completely, but it'll free your mind up enough to not analyze every last move as you finish up. 3. Hire help. Sometimes I can't seem to finish a project if I have too many other things on my "to-do" list. So I have been known to hire a maid to clean my house. It helps me focus on my art instead of the other things demanding my time. So, I'll go back to being a professional tomorrow. Now it's time to take a break! Enjoy yours! The following list is in no particular order, just things to think about, incorporate and consider when you are illustrating a picture book. 1. 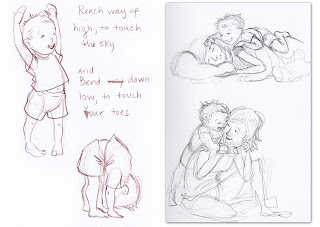 Draw Kids...babies, toddlers, preschoolers, k-5: Even if you are someone who illustrates with animals rather than people, drawing children is a great way to then mimic childlike actions, behaviors, and positions in whatever characters you draw. This will in turn, help children identify with your characters better. 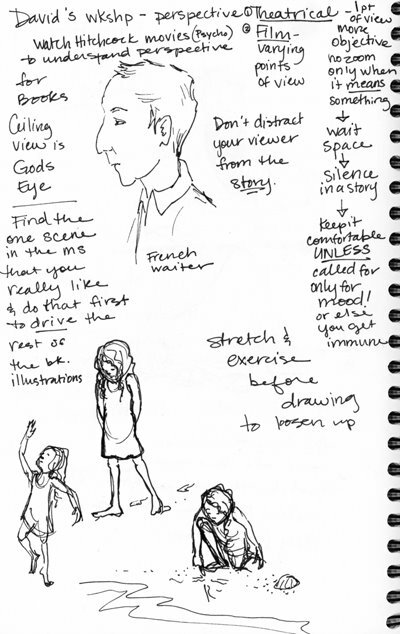 If you don't have kids of your own to observe and sketch from, go to a playground and spend the afternoon sketching (just try not to look too creepy doing it...bring along one of your published books or pocket portfolio to verify your purpose being there, just in case). 2. 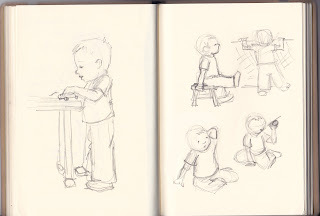 Draw objects and background scenes. The most enjoyable part of a drawing for me comes through the main characters. The "hard part" is the background. However, to get a job illustrating picture books, you can't just be good at drawing characters. You almost have to become a landscape painter, an interior designer, an architect, and a set designer all at once. Whew! Who knew being a children's book illustrator was so tough. So, draw and PAINT plenty of THINGS. 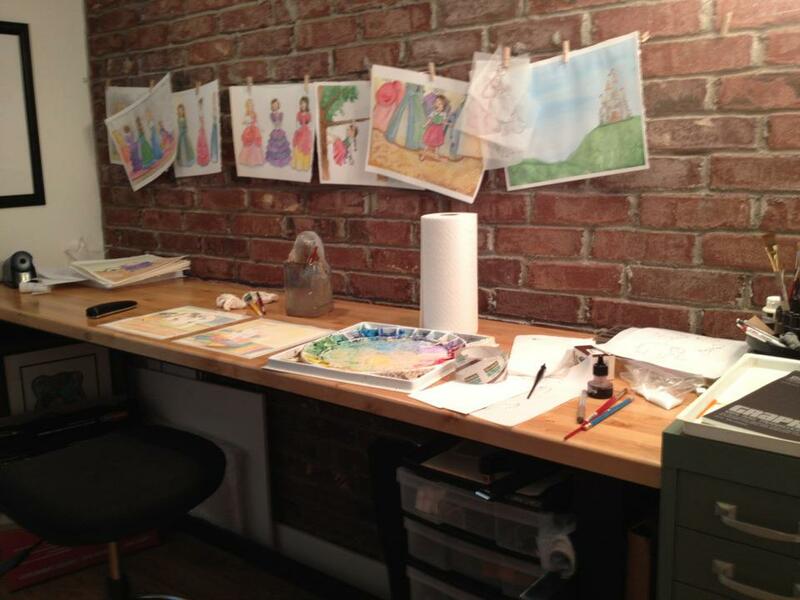 Draw when you are outside, sketch when you are in the city, paint pictures of interior spaces. Soak it all in! 3. Hone your 2D design skills. Take a 2 Dimensional Design class online or one offered nearby. Design doesn't hone your drawing skills, but to be a good artist/illustrator (especially where books are concerned), you MUST be a good designer. Practice designing compositions with a few basic shapes. I once had to design 100 different compositions using only varying sizes of black circles. After that, I was so grateful and more aware of the varying basic shapes there are to use in compositions. Design itself tells a story. It reflects action, mood, and tone. A simple site like this may offer some online assignments you can do from home. 4. Think about Color. Artists like Maxfield Parrish understood color enough to manipulate it's characteristics. I recommend a simple site like this if you are just beginning http://thevirtualinstructor.com/Color.html or a book. I used Itten's The Elements of Color in college, and I still have it to browse through now and then. However, a hard copy is quite pricey now. For the most part, I would play and experiment with color. Color and value sets mood, tone, voice, and place in every picture book...even if it's black and white. And remember, color won't help if the design is bad. 5. Design your characters. Every main, supporting and background character in a picture book should be designed. Each character needs to look like an individual. Just like every person or animal on earth is unique, so should be your characters. 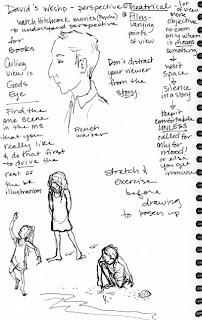 You especially need to know your main characters enough to be able to draw them in any position, mood, or situation and still appear recognizable as THAT specific character. 6. 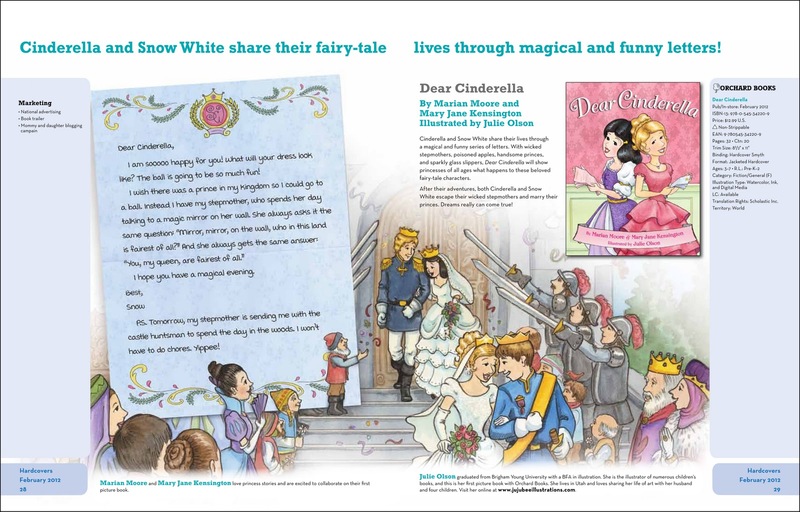 Utilize every page to tell your story by understanding the picture book format. Look at tons of picture books. There are a few rule breakers, but essentially, a picture book must have a page count that is divisible by 8. Most books are 32 pages. I provide a layout map HERE. The front matter can vary slightly, but the text begins on page 4 or 5 and ends on a single page (32) at the end. An understanding of this format will allow you to utilize all the pages you can to tell the story. 7. Design your entire book. After you understand the layout of the book, make sure what you put in it is planned out completely. Draw Thumbnails for each page (many many many different ones). You can print out Thumbnail Sheets Here and Here. Remember most books are about 9x10 or 8.5x11, vertical. It costs the publishers more to do horizontal, or square, etc. So if your book needs to be another format, find out from the publisher what they agree to. When you are done drawing thumbnails, choose the scenes you like best and put them together in order. Make sure your book flows from front to back and that designs from page to page are not repetitive or boring. Make the design reflect the text. 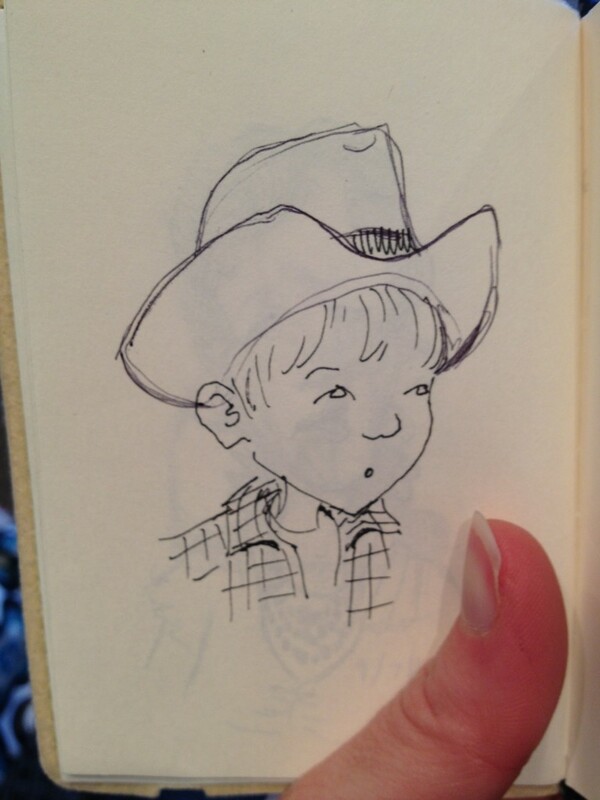 In Annie McRae, I added a little brother to the scenes of the book even though he's never mentioned in the text. He interacts with Annie and is even the only fully displayed character in one scene. In Heard of Cows, I added a deck of cards that falls off the nightstand and floats through the rest of the subsequent illustrations. In Already Asleep, I created a relationship between a cat and a mouse playing through the scenes, culminating with a friendship on the back cover. In The Happiest Mommy Ever, I used the book design for the substory element. The scenes in the past are designed in scrapbook form, and the present are vignettes. 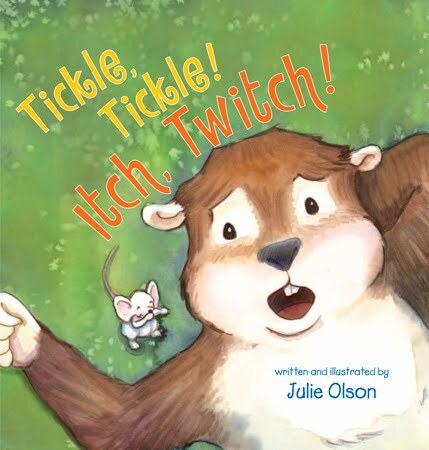 In Tickle Tickle, I never mention a mouse in the text, yet he is integral to the story's plot. This is a more complex example of telling the story beyond the text. 9. Attend Conferences and Workshops. There exists a vast network of professionals in the industry out there sharing their knowledge...utilize it. The SCBWI (Society of Children's Book Writers and Illustrators) is GREAT for those newer to the industry and I highly recommend their national conferences. Their local/regional chapters often hold beneficial conferences as well. 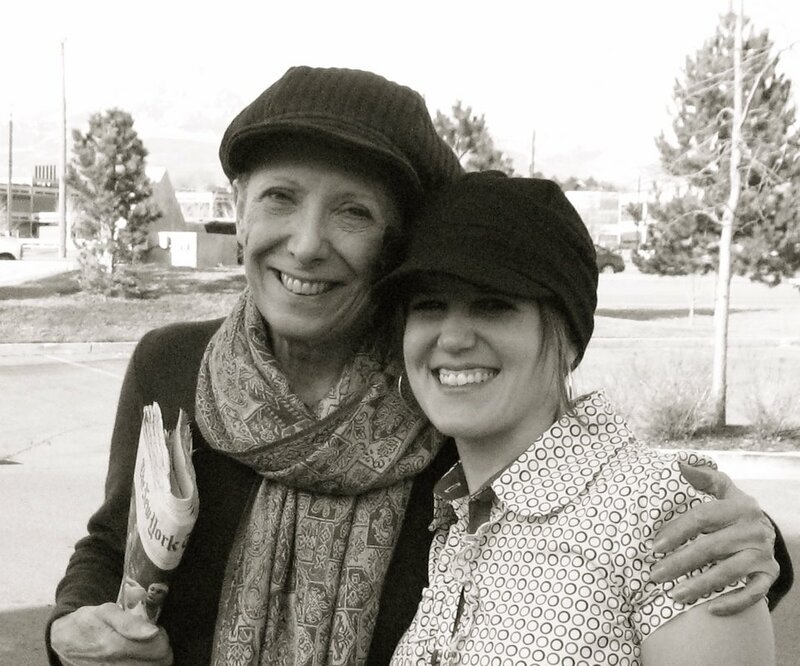 The yearly Writing and Illustrating for Young Readers is an intensive, AMAZING, week-long conference held near Salt Lake City, Utah. In addition, local one-day conferences, like Writing For Charity, often offer a wealth of knowledge for an inexpensive fee and go to a good cause. Beyond the knowledge you gain, you can also network, join critique groups, and meet agents and editors willing to accept your submissions just because you came to that conference. 10. Use a Blog, Website, Print and Social Media. No one will know you and your art exist unless you show them. These days, that's primarily through the internet. Put your best work out there. You can put a small watermark on your images or just make them small and pixelated enough to be limited to web use only. Twitter and/or facebook can be another avenue to share your work AND become connected with like-minded people who encourage your talents. In addition, you can create and print postcard mailers to mail to publishers as promo pieces. They receive tons of these so be creative. Use the mailing list that SCBWI provides to it's members. Make sure you are only mailing to relevant publishers. Warning: Post is unrelated to illustration except for the picture showing a shot of my studio. I received a MASSIVE heart attack this morning. My alarm buzzed at 6:20 and I was so tempted to hit snooze. But instead, I stumbled out of bed and shuffled to the bathroom to get dressed and hit the treadmill. I shut the door and turned on the lights and it HIT me...a heart attack. No, not the medical, health related kind. But the sweet loving gesture of someone who loves you. My hubby had woken up in the middle of the night (so I wouldn't know of course) and plastered our house with post-it hearts covered in messages of love. He's such a sweetheart. He really doesn't like Valentines Day, to be truthful, but he swallowed the feelings of annoyance at a day where he's told he HAS to express love, and gave me this sweet and thoughtful gift. He's a wonderful guy and can be really romantic...I am a lucky gal. 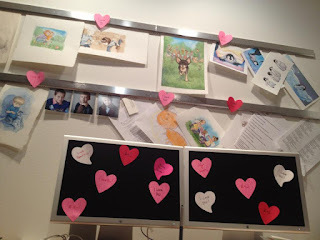 So here's a shot of some of the hearts in my office studio. However, this doesn't do it justice. Hearts were all over the house, the car and my cupboards and purse. He went all out. I hope each of you have a great Valentine in your life...be it spouse, pet, child, sibling, parent, or friend. We all deserve a little love. So you put a bit of yourself into every book you make...especially one that you write and illustrate yourself. Then you take that part of yourself and you throw it out into the world with one wish...for someone to love it and take care of it. Because after all, it's a part of yourself you never get back. So when someone finds it, takes it in, loves it, and then shares it with others, you can't help but feel like you've done something good, and in some small way, made the world a more enjoyable place...if only for a moment. I was fortunate enough to have that feeling today. 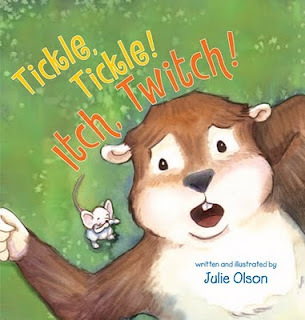 I was just asked by the Iowa City Public Library for permission to record and rebroadcast a storytime reading of my book "Tickle, Tickle! Itch, Twitch!" on their local access channel. I don't know how many viewers they have, but as a college town full of book lovers, I sure hope they love mine. I was honored to receive this request from librarians I've never even met. It sure makes me smile to know that people out there enjoy my book enough to share it. Thank you, Iowa City! I think I need to get out...or go on a vacation. I laughed as I started this post because I realized that yesterday I posted about a book where the character goes on a long bike ride and now today's post about Roxie Munro's A-MAZE-ing Vacation. Can you say "cabin fever" or "winter blues." So here I go, vicariously living again. 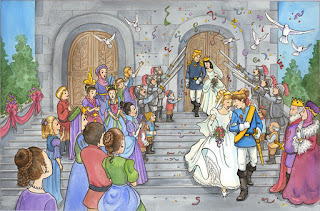 Roxie Munro is an author/illustrator whose work I've come to know recently through a facebook group we are in together. She has created some fun books but more recently, some fun apps for the ipad and iphone. Take your kids on a pseudo vacation while they wait at the dentist or ride in the car. I also love her other app just for ipad. Really fun way to do a lift-the-flap book. These are the kinds of books that beg to be made into interactive apps. Way to go, Roxie. What a fun experience! Frank Viva's "Along a Long Road"
Today I wish I were in Frank Viva's "Along a Long Road." I love this picture book. It does so many things well. First of all, it's a simple but complete story...a journey of a boy on a bike...complete with ups and downs. Second, it's visually stunning to me. The vintage yet modern, poster-style, graphic images make me feel an odd nostalgia. The simple, well-designed shapes give the whole setting...even the speed of the cyclist. And I love how the road never ends. From cover to cover, each road picks up where the other left off as you turn the page, following the words as they end saying "And start all over again." Third, the quality of the paper and embellishments push the book above and beyond. The matte paper feels thick and soft to the touch while the shiny yellow road begs to have a finger follow along. Finally, as a very amateur cyclist myself, this book makes me want to get out and RIDE! So this February day, I'm missing my bike and the open road. Alas, there it hangs, in the garage on the wall. 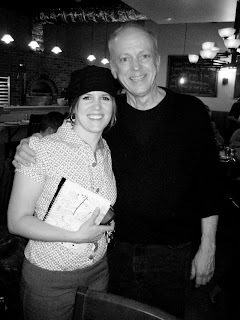 But thank you, Frank Viva, for allowing me to go "Along a Long Road" with you instead. Here's a little sketch from my mini sketchbook. 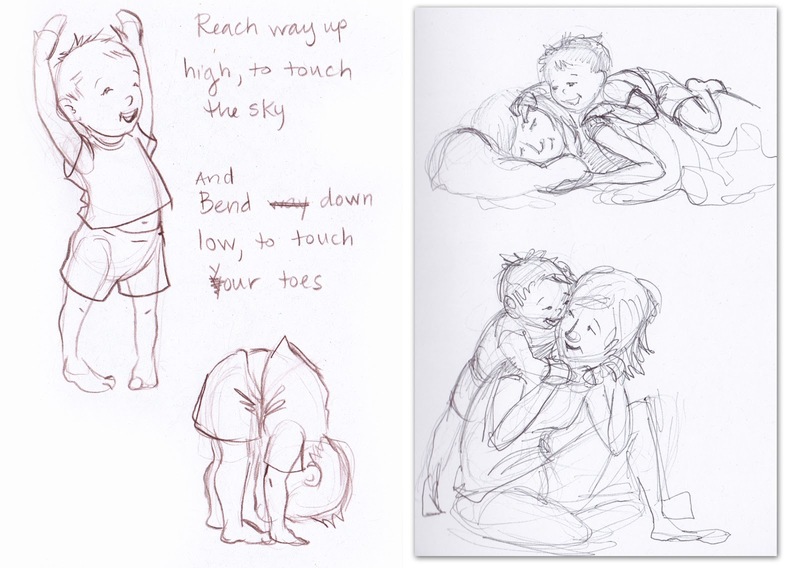 It's a little idea for a baby/toddler yoga book. My second son used to do yoga with me every day. It was adorable. the hands of underprivileged children. March 17, 2012 (that's St. I've been working on this trailer for a little while now. I wanted to make it more than a slide show (like my others have been). So I asked my friend and master animator/illustrator, Jed Henry, to give me a tutorial on Adobe AfterEffects. So thanks to him, I was willing to brave an attempt at this robust software. My animations aren't near as smooth and beautiful as his, but I think it turned out pretty well for an amateur attempt. I especially was excited to make the movements "dance" with the music. If I was really good and had more time, I would make them dance even more. But I've got to stop myself at some point and work on real work. Hope you enjoy! It's officially available (although I think you could purchase it a week ago). February 1, 2012 is the official release date of "Dear Cinderella." I was hoping to have the book trailer done by today to show you all, but I'm trying my hand at a video program called AfterEffects so it's taking me longer. In the meantime, I'll show you the catalog page from Scholastic on the book. 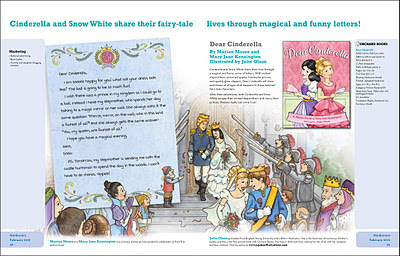 If you have a little girl who loves these princesses, she's the girl for this book...a great Valentines Day gift. I love that it also inadvertently teaches about the lost art of letter writing. I remember having a pen pal while I was in elementary school (a girl from another school). It was great fun.